In-home care agencies and other health providers like chiropractors, optometrists, even pharmacies need ways to make it easy for clients to make and keep their appointments in order to make their service and practice run efficiently. 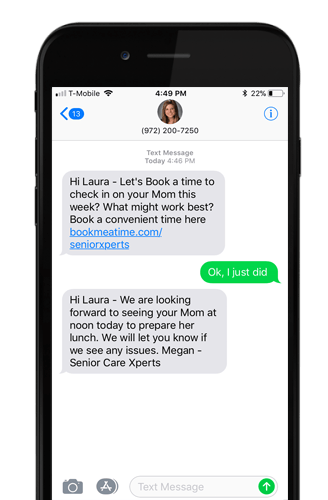 Textellent allows these businesses to easily invite customers or family members to schedule appointments via texting and select the staff member they need for the appointment. Appointment reminders are automatically sent and, if necessary, appointments can easily be rescheduled and updated in the company calendar. In-home care agencies can use the service to send appointment reminders to staff as well. Post-appointment texts can be sent to family members to let them know what services were rendered to improve family communications. Health providers can send notifications that lab results are in or prescriptions, glasses, etc. are ready for pick-up reducing customer wait times and improving practice efficiency.